Ahh, it’s finally October! The crisp fall air has us all excited for the season of flannels, sweaters, pumpkin spice everything, and most importantly…Halloween! Although some of who are Halloween-obsessed plan your costumes months in advance, we’ll just say a large majority of us tend to put our costume ideas on the back-burner. If you have found yourself frantically rummaging through your closet to put a costume together the day of, this post is perfect for you! We are going to throw a few low-maintenance costume ideas your way – most of the products we mention are likely sitting in your makeup reservoir right now! A convenient and low-cost Halloween look? Count me in! Here are a few products that will help you achieve a memorable Halloween look…even if you put it together the day of. Black eyeliner is the holy grail for just about any Halloween look. Use your eyeliner to create whiskers for a traditional cat look, or draw a button nose and throw on some mouse ears. If you are feeling really creative, use your eyeliner to draw a skull face. Add extra dimension to your skull look by contouring with black eyeshadow. Whatever look you decide, that trusty eyeliner will be there to help you achieve a cute to ultra-scary look! on the blending for this Halloween look. Use your contour to achieve a dark brown accent to create a perfectly-chiseled deer face. Use your concealer to create white spots…and tah-dah you’ve just transformed into bambi! Also, pair your bambi makeup look with a pair of space buns and sticks…now you have antlers to complete the look! Chances are over time, you’ve collected a few funky eyeshadow colors. Maybe you have a bold blue, pigmented purple, or pretty pink eyeshadow color – any of these colors works perfectly to achieve a mermaid-inspired look. Channel your inner mermaid by contouring your face with blue, purple, and pink hues. Dress up your eyes with complimenting eyeshadow as well. Don’t be afraid to really accent your look with lots of highlighter and glitter! 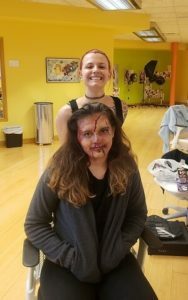 What’s really great about Halloween is that it allows you to think out of the box when it comes to your makeup, which is something we can’t always do on a daily basis! What does that mean? Halloween is a great excuse to break out your dramatic falsies! Lashes can add a cute element on top of your creepy look! Want to become a makeup expert beyond Halloween? Connect with us to explore our Cosmetology Programs and learn the skills to become a beauty expert!